How do you know if the brown spots in your lawn are caused by the heat (that you can not do anything about) or something else (that you can do something about)? I know it can be a challenge to provide possible answers to this mystery. However, I think you may be able to use these photos to figure out what could be causing brown spots in your lawn. 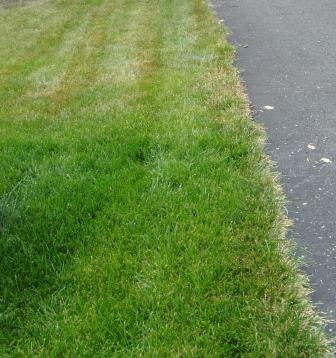 Photo 1: Do some areas of your lawn always seem to turn brown first? Probe the brown spot with a screwdriver and compare this with the healthy lawn areas. I have found that the typical brown, tan-colored “dry spot” can show up because of a pocket of poor soil, a buried rock that is just below the soil surface, or an area where lawn sprinklers don’t provide complete coverage making it tougher for the screwdriver to penetrate. 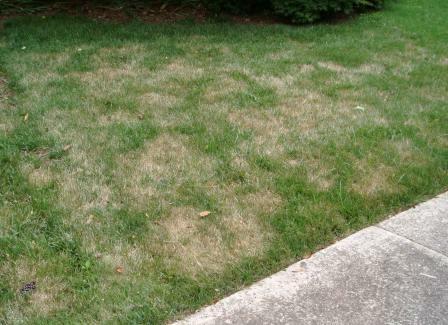 So you think your lawn is getting adequate water, however this dry spot is the first area to go brown. Solution: Short term: Give extra water to this area until you are able to improve the soil in this spot, dig up buried rock or adjust sprinklers. Photo 2: Does the grass look different in this area which would indicate a different grass type than you have in the rest of the lawn? Some grasses like Annual Bluegrass (Poa Annua), Redtop, or Poa Trivialis turn brown more quickly in hot, dry weather than the more hardy grasses found in today’s better seed blends. Solution: Longer term plan to kill poor grass in these spots with Roundup and plant stronger grass in these spots. Photo 3: Are the brown grass blades mixed in with the green grass blades in no particular pattern almost like the lawn is dry, yet you have been getting rainfall? This could be an insect problem or your lawn could be starving if it has been more than a few months since the last feeding. One clue to look for with insects is the presence of lawn moths when you mow. The moths do not damage your lawn, however they lay eggs for sod webworm, cutworm and other lawn damaging insects. Chinchbug damage also looks like the grass in this photo. Solution: Feed and protect your lawn with an application of Turf Builder with SummerGuard. Be sure to water after spreading. Photo 4: Are the brown spots following a particular pattern such as a circle? Within the circle the problem may start with some of the grass blades turning brown with spots on them. There are a range of lawn fungus problems like dollar spot, brown patch, red thread and summer patch that show up as circular patches in your lawn. These problems can crop up when you are getting higher temps during day and night and more rain and humidity. Solution: Treat your lawn with Scotts Lawn Fungus Control. 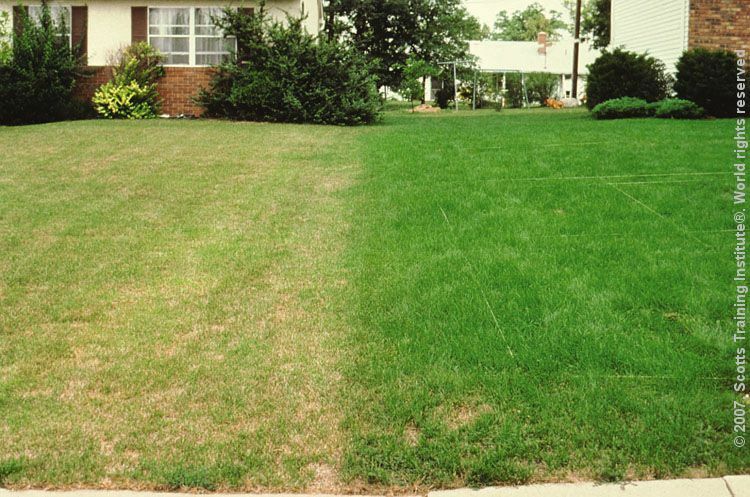 If you still can not figure out your brown spot problem, you can contact our Scotts Help Center to have onoe of our lawn experts help you figure it out. My brown grass areas showed up right after I used Scott’s weed and feed, so what did I do wrong. I had the spreader on the correct setting and was very careful not to over spread. Frustrating.. And the crabgrass is taking over!,, it loved the weed and feed! Sorry to hear about your brown grass. Some grass types are sensitive to weed controls when temperatures are in the 90’s or above, especially during dry weather and if the product is applied too heavy. This damage can be temporary as the grass can begin to recover once growing conditions improve. Water the areas good. If you do not see improvement in a month or so, the areas will likely need to be seeded this fall. Also, the typical weed and feed does not control crabgrass. Ortho Weed B Gon MAX plus Crabgrass Killer can be used, however I would not spray the grass in the brown areas, especially if the temps do not drop. The primary grass in your area is Fescue, which benefits from two or three fall feedings with the last one around Thanksgiving. Bermuda and Zoysia are also grown in your area, which generally only need a single fall feeding. I looked back at Judy’s description of her problem and my suggestions. If you need more info tell me more about your specific situation and I will make suggestions. What is your procedure to kill grab grass if we are also seeding this month? Hi Richard…. Two choices. Wait till the crabgrass is killed by frost which might be too late to seed, or kill the crabgrass with Roundup and then seed 7 days later. Sounds like your lawn was well fed prior to going into dormancy. As long as you were protected from insects like sodwebworm and chinchbug, your lawn can stay in that dormant state for 4 to 8 weeks and bounce back fine when you start getting regular rainfall. You can feed with Turf Builder plus SummerGuard when you start getting rain again or when you are able to begin irrigation. Minimize the amount of foot traffic on your lawn while it is dormant. Also, should I mow before I put down the summer guard? If your lawn needs mowing, go ahead and give it a cut prior to putting down Turf Builder plus SummerGuard. You should water after putting down this product. You can then spray weeds with Ortho Weed B Gon plus Crabgrass Killer a few days later. Thanks for the response. Your website is amazing. This is my first season with a green plush lawn but with the hot dry month of July on long island with no rain, my lawn seems to desperately need the summer feed as well as the ortho as the weeds have been popping up like crazy. Two questions, can I spray the entire lawn with the ortho as the weeds are very sporadic or will it kill the lawn? Last, what are your thoughts with water in ny in July/august ( long watering for 30 minutes or so a couple of times a week or do you recommend everyday for short periods). I have been doing every night for 30 minutes. You can spray your entire lawn with Ortho Weed B Gon MAX if the weeds are everywhere as this product will not injure your good grass. Pick a day when temps are in the 80’s or lower. It is better to water 1/2 inch twice a week than a little bit each day. Put an ice tea glass on your lawn and measure how much water you collect with a half inch watering. You then can calculate how long to run your sprinklers to put down a 1/2 inch of water. I have a question about fertilizing and small pets. How harmful is the fertilizer to pets? Lawn Fertilizer is not harmful to pets. (As a long time cat owner, I keep the cats inside while I am spreading so there is no chance of dust blowing into their eyes.) If you use a lawn fertilizer combined with a weed control or insect control check out the directions for your pets. You will find that with a weed and feed you should apply to moist foliage and keep your pets off the lawn for 24 hours so that the particles will stay on the weed leaves to get absorbed into the plant. For a lawn fertilizer plus insect control it is best to water after applying, then pets can go on the lawn after the grass has dried. I used the Scott’s Summer Guard on Saturday and watered after putting the product down. We got hit with a storm Sunday night and got about 6 inches of water. My property is on a hill with a slight slope. Do I need to re fertilize since we had all that rain? Suggest you wait to do your next feeding around the end of August. Even with the heavy rain, my thoughts are that your grass plants trapped the granules in place. If there was bare soil and the rain did some erosion, then some of the lawn food may have washed. Yes, you can water and feed with Turf Builder, GreenMax or Turf Builder with SummerGuard insect control. It would also be good to water after feeding since you have been dry. Hope you got some rain with the weather pattern yesterday in the midwest. I have the Scotts lawn service this year.I am wondering about the crab grass. I have been trying to pull it..and can continue. However, it leaves rather large dirt patches. Do I just leave those alone until the fall , then have to seed them? or does Scotts do that for me? There are a couple of ways you can go depending on your lawn situtation. For that reason, I suggest you contact Scotts Lawn Service directly to have them tell you the approach they suggest based on looking at your lawn. There is a customer service phone number for your local area on the billing info and other materials they have left with you. Good luck with your lawn! You can overseed in early September. If your lawn is fairly thick now, much of your seed will not grow well if it does not come in contact with the soil. If your lawn is thin and you can see soil in some areas, break the soil up a little bit with a shovel or rake so the seed has a place to germinate. You can lime anytime this fall. A soil test will tell you how much to put down. The general recommendation is for 50 lbs per 1,000 sq. ft.
Last year mid summer, I used Scotts Quick fix to fill in bare spots in my lawn. The new seeds sprouted quickly. The lawn looked beautiful Turf was thick and healthy. This year with the drought conditions, everywhere I filled in with the temporary grass (which I know now was an annual ryegrass) are brown while my original ground cover is still green. I have been able to maintain it with watering. How do I go about restoring these areas? Do I overseed with a more drought tolerant perrenial and dethatch the dead temporary grass over the next few months? You can seed your spots with Scotts EZ Seed. This supplies your grass seed, a special mulch and a starter fertilizer. All the grass varieties are perennial. Is it bad to use the ortho weed b gone plus crabgrass after you mowed? (mowed this morning). Also, next four days are mid 80’s. Is that okay? Since you want the spray to hit the weed leaves, as long as they are exposed, it is ok to spray after you mow and temps in the 80’s are just fine. I am using KLEENUP and the sprayer has stopped working with the bottle still 3/8ths full. Sorry you are having a problem. KLEENUP is sold by one of our competitors. Check to see if they have info on their package to contact them. I just found out I have a grub problem, Once I put the Grub ex down will it help the dead grass turn green again or do I need to add other products to help my lawn, The rest of my lawn is still green, only patches of my grass has become brown and has died. Please Help.. Thanks! GrubEx will not turn your brown grass green. However, if the active problem is now gone, your grass may fill in depending on what type of grass you have. Let me know where you are located and I will suggest your next steps. Also let me know when the damage first showed up and what you have put on your lawn so far this year. Thanks. How long after I used Scott’s summer guard and ortho weed b gone max w crabgrass can I seed some bare sports? Also can I use a starter fertilizer? Suggest you wait a month, which will put you in a better time to seed prior to the cooler fall weather. If you use Scotts EZ Seed to fill in your bare patches, Scotts Starter Fertilizer is already in this product. Good Luck with your lawn. I have tan blades of grass throughout my green grass. I have noticed that we have mushrooms growing throughout the lawn and a little of webbing like spider webs. How can I fix all of this? The mushrooms are likely not causing a problem. These are temporary growths from the kinds of fungi that break down organic matter in your soil (like old tree roots, etc.) This type of fungus does not attack living plants and the mushrooms will soon go away on their own. The webs you are seeing are likely from one of the fungi that do attack grass, like Dollar Spot. 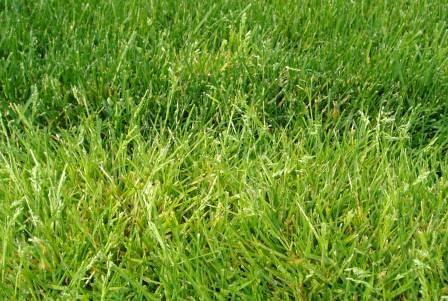 You may see some white spots up to a quarter inch in size on individual grass blades that are otherwise green. You can treat this and other lawn damaging fungus problems with Scotts Lawn Fungus Control. Every product has it’s own spreader setting based on particle size, bulk density and how much product is needed per square foot. The variables that can make a difference in coverage include walking speed and humidity. I suggest you call our Help Line (1-800-543-TURF) and explain to them what happened. Thanks for letting us know. Is there any cure for female dog urine spots on your lawn ? Some folks have been able to train their dog to go to a mulched or graveled area rather than the grass. If this does not work, they have trained their dog to go to one small out of the way lawn area. Some folks have found a way to modify their dog’s diet to minimize damage. Watering the spots soon after helps to dilute. Scotts EZ Seed Dog Spot Repair is a special seed blend that helps to neutralize the soluble salts in the spot so grass seed can grow more easily. My lawn was doing great in may. June rains came and red thread in small and large circles. The week and a half of 90 to 100 deg. Weather. The patches are now dead. What can I do to revive the lawn. It looks horrible. We thached the dead grass out. looking how to bring it back to life. Please help. Your Red Thread areas may come back this fall with cooler weather and when you feed your lawn. A severe Red Thread problem, especially in a lawn that is not a blend of several grass types, may cause you to have to seed those areas in Early September. Scotts Lawn Fungus Control will help prevent and cure this fungus disease if applied when the symptoms are first noticed. Once your temps start to cool so you are not getting in the high 80’s and above, you can feed to encourage your lawn to recover. Turf Builder SummerGuard would be a good choice as it also controls insects that could attack your weakened grass. Feeding will help you decide if you will need to seed those areas as you see how your grass recovers. is there a good way to eliminate clover in my yard? My lawn has turned brown due to hot temperatures last summer, do I need to turn over the lawn to repair it? Tell me where you are located so I can give you some specific recommendations. Thanks for telling me where you are located… this really helps. If you had no green grass last fall after the hot summer and if you peel back brown grass blades from an individual grass plant now and do not see any pale green or white growth beginning to show, then I would say your lawn is dead. Your grass seed will have a better chance of growing if you break the first few inches of soil. The Scotts Turf Builder Heat-Tolerant Blue Grass Seed Blend or Scotts Turf Builder Sun and Shade Grass Seed Blend will do well in your area. I suggest you put down a special lawn food and weed preventer when you seed: Turf Builder Starter Lawn Food with Weed Preventer. Keep your new seed watered (several times a day) until you see germination. Good Luck with your new lawn. Thanks for giving me so much info. The two problems that show up in your area as brown grass that can easily be raked up in spring is Snow Mold and Grubs. Your new grass, with younger less established roots may have been more prone to injury than your mature grass. I have written about Snow Mold and Grubs in many of my blog postings. The sooner you seed those areas this spring the more established they will become before summer and next winter. You can put down GrubEx after your new grass has grown enough to be mowed once and this will protect against grub problems this fall and next spring. Good Luck. I recently laid down new Palmetto St. Augustine sod on my lawn in st. Petersburg, FL. It has been approximately 6-7 months since I laid the new sod down and truthfully I was hoping that it would be holding up better than it has thus far. We have had very warm (90+) temperatures and dry conditions over the last 2-3 months. Therefore, I have had to frequently adjust my watering schedule where I am now watering 3 times a week at 5am on those days. The lawn is receiving proper coverage during the watering as well. In addition, I also have a spray company come out once every 2 months for regular maintenance (spray, fertilize, etc). Even after all of this constant attention, the lawn is still brown is some spots and dead in patchy areas. What do you recommend I do to prevent the lawn from getting any worse? Any ideas on how to improve this situation? First regarding your watering: Measure how much water you are putting down by placing a rain gauge on your lawn or straight sided glass. Your target is a half inch of water twice a week. Adjust the times on your sprinklers to put this much water down. Second, the primary insect problems in your area are chinch bugs and sod webworms. Brown, thin grass from these insects would not take on a particular pattern and would be mainly in sunny areas. You may notice lawn moths flying in your grass in the evening. They do no damage, however they lay eggs for sod webworms. Hopefully you are getting adequate protection from these pests from your lawn spray company. Third, the primary fungus problem in your area on St. Augustine is Brown Patch. This disease shows up as circular patterns about 12 inches or so in diameter. Scotts has a Lawn Fungus Control to threat this. Hope this helps. We just had Bermuda sod put down exactly a month ago. My lawn guy said to wait to have the rest of the yard sprayed for weeds in the area that we didn’t put down sod. The weedman showed up unexpectedly and sprayed with 65% slow release granular fertilizer and spot treated with tribute total a liquid post emergent weed control. A few hours later there were white spots on the sod. Looks like dead grass areas. What can I do? My lawn guy is out of town and will come look at it in a few days. He said to just water it like crazy. Any other advice? The slow release feeding is likely ok. If the damage is from the weed control I think your grass will recover as this is likely temporary. The key is to keep the lawn watered so it does not dry out while it is becoming well rooted. This watering will also help the areas that may be showing the spots you describe. Good Luck! My lawn has always looked really green. This year it is brown and looks dead and when you walk on it is crunchy. It rained her in Utah for a good 8 weeks and no one could mow their lawn it was so wet. My lawn got so long that we mowed in anyway and the bag would not even pick up the clippings. The clippings were left and I think killed the lawn. I have in the last week raking all the grass that was still deep in the lawn. I have been water 20 minutes and I have an automatice sprinkler system. I water at midnight. I have treid to go through and find all the sprinkers and dig them all up. They were buried into the grass. I think I need to still modify some of the sprinklers that are not working. I am alone so no one to help me. I have had lawn care company and sense I hired Scotts Lawn care it has just got worse. I just want to give up. Your grass needs to recover from the mowing problem and from your description your sprinkler schedule needs to be adjusted. I think both of these issues are contributing to a lawn disease problem. Suggest you get your lawn service to evaluate your next steps and help you adjust your sprinkler system for a proper watering schedule. I live in central illinois. We have had plenty of rain this growing season, yet there are spots in my lawn that are beginning to turn brown. It always happens, in the same spots every year. The yard is well drained, I cut at the correct height, fertilize in the spring and fall, and there is not a lot of thatch build-up. When the grass turns brown, it ultimately dies. I pull back the grass and I see no grubs or cinch bugs. I do not have pets in the lawn. the areas that turn brown receive plenty of sun. Can you help me? Thanks for giving me your location as this really helps narrow down the problem. In your area there is a lawn fungus that attacks Ky Bluegrass lawns at the beginning of summer called Summer Patch (also called Fusarium Blight or Necrotic Ring Spot). It tends to show up in the same areas of the lawn every year (sunny areas). It is more common on sodded lawns than those that were seeded. The spots are about 8 to 12 inches across and the grass is straw colored. Sometimes there is a green patch of grass in the center showing a “donut look”. Scotts Lawn Fungus Control is a granular product that provides some prevention if put down when the fungus is first noticed. Grass blends that contain turf-type tall fescue and/or perennial Ryegrass show some resistance. Your area also gets grubs, however that damage would show up more in late summer, fall and early spring. Billbug grubs and adults can cause a similar damage as the fungus I described. Sometimes Billbugs stress the lawn and the fungus gets an easier start. A GrubEX application in early May should help control this insect. Hope I have given you some ideas that will help you solve your problem. Thanks for the prompt reply. I purchased the Scotts Lawn Fungus Control. I purchased four bags, but they are relatively small. Is it necessary that I treat the entire lawn, or can I just treat the problem areas? Will this take care of the problem or will it be necessary to do this annually? I assume the brown areas are already dead, but will this prevent the spreading? After application, I water it in, correct? I have noticed this, year after year. I bet the fungus is the problem. Use the spreader setting for the Normal Rate (Curative Rate) and then follow up in 2 to 3 weeks at the Prevention Rate. The bags cover 2,500 sq. ft. (25 ft. by 100 ft.) at the Normal Rate or 5,000 sq. ft. at the Prevention Rate. Since there is no lawn food in the product you can treat the areas where the problem is now and where you expect it to spread. Water after spreading and continue water (or rainfall) at a half inch twice a week. Use a rain gauge to indicate how long to run your sprinklers to get a half inch. Next year have some bags on hand to treat the areas that are prone to this disease at the first sign of a problem. Good Luck. Hello from north Louisiana we have had triple digit temps over the past two weeks my grass is brown only where the sprinklers don’t hit. So my question is can I weed and feed the lawn now (high 90s) there is this stringy weed I want to rid my yard of. It grows about 2ft tall and about 3x the rate of the grass. Thanks for giving me your location. Weed and Feeds or Weed sprays work best when the mid day temps do not get above the upper 80’s. When the temps are high the weeds are not growing as much so the weed controls do not get absorbed as well to do the kill. Also the grass is stressed with the high temps and more easily injured. The grass that is brown from no water is even more susceptible to injury. When your temps drop, be sure to use a weed control or weed & feed that can be used on your type of grass. In your area folks have Bermuda, Zoysia, Centipede and St. Augustine grass lawns. There may be a few lawns with shade that are fescue, however that grass is more common further north. I am not sure what kind of weed you are describing. Nutsedge is a grassy weed that grows taller than the good grass between mowing, however it would not get to be 2 ft. tall. Could mowing my lawn kill my grass and make it wrose when my lawn is all ready head and it dry and humit out and have not had any rain in long time . Brown dormant grass can survive a month or so while waiting for the next rainfall or irrigation. It is best to stay off the lawn as much as possible during this time. Since the grass is not actively growing, mowing is not generally needed. Yes, I will send you an email so you can reply with pictures.